Finding that perfect pair of jeans—the ones that make you feel fabulous and ready to take on the world— is the fashion version of The Dating Game. 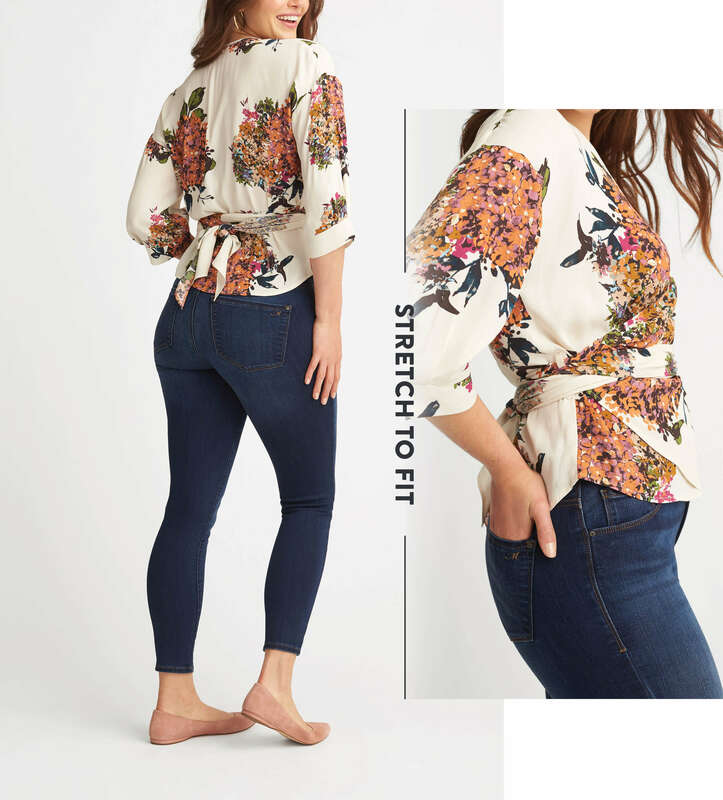 If you’re pear-shaped, the search for the ideal fit can seem daunting, but we’re here to help you find your denim soulmate! Scroll on to read about the best jeans for pear shapes. If you consider yourself pear-shaped, you likely have a smaller upper body, fuller hips and a more ample derriere. 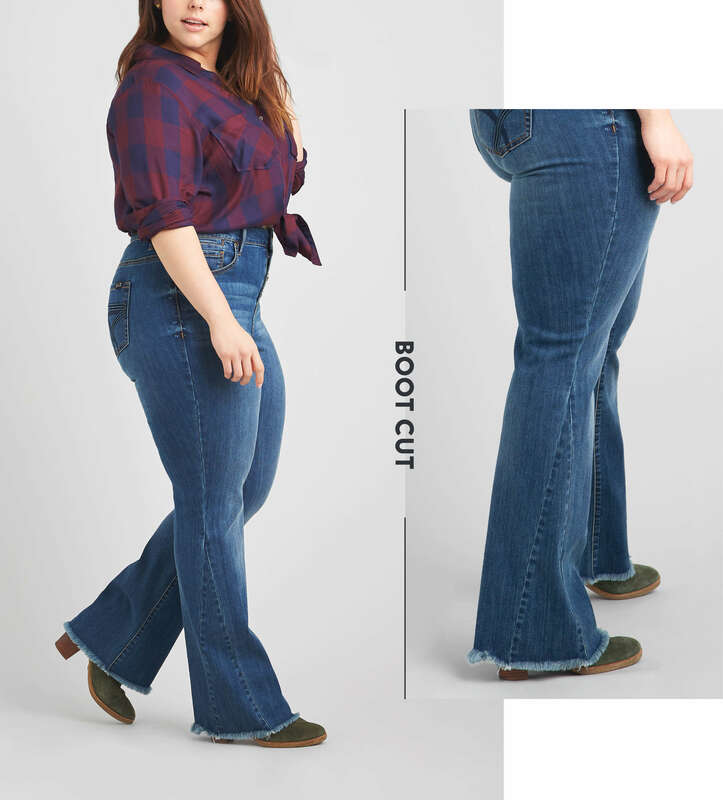 To flatter your figure, opt for bootcut or wide-legged denim; these silhouettes skim your shape without hiding curves, and the sleek lines will elongate your legs. Feeling more adventurous? Try a pair of on-trend flares or a cropped bootcut style! Bummed that we didn’t mention skinnies above? Don’t fret; pear shapes can absolutely rock skinny jeans! The key is all in the rise. Look for high rise skinnies, as they typically highlight the smallest part of your waist. As a bonus, a higher rise can prevent gapping at the waist and smooth over muffin-tops. For other denim cuts, a high rise is an excellent choice, but you can also opt for a mid rise to lengthen your legline. Make dark wash denim your everyday go-to. Darker hues are timeless, universally flattering and easy to dress up or down. If you’re loving the edgy, distressed look, you may want to avoid whiskering across the hips, which can make them look wider. Since denim comes in every color under the sun, don’t be afraid to play with other darker shades— variety is the spice of life (and closets!) Rich jewel tones, like eggplant, wine and emerald, are sure-fire compliment magnets. If you’ve got magpie tendencies, bedazzled jeans may draw your attention. However, embroidery, rhinestones or flaps on your back pockets can make your hips and rear look wider. If you’ve gotta have sparkles, look for jeans that are embellished down the sides or near the ankle. Alternately, refocus your shimmer on fun statement jewelry instead. Above all, remember that these are all just guidelines, not hard and fast rules. The perfect jeans for you are the ones that make you feel confident and beautiful! Looking to fall in love with a new pair of jeans? Schedule a Fix, and let your Stylist play matchmaker!